Voting is now OPEN for the 2013 Hero Dog Awards. 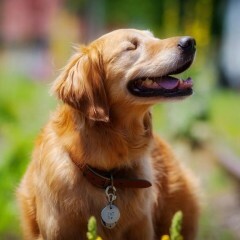 We are honored to be one of the 23 nationwide charity partners of the American Humane Association. We've earned that distinction thanks to our quality, innovative programs — like our Abilities Through Agility program at ChildServe. We've been chosen by two nominees as their charity partner in the Therapy Dog category. If Dutchess or Patch win their category, Paws & Effect receives a donation of $1,500. If either wins the entire competition, we receive a $5,000 donation — funds that would help us to accomplish and expand our programming. You can vote once per day, per email address, per category. Pick one and VOTE! WHO-TV Covers Paws & Effect: "Dogs on Duty"
WHO-TV, our local NBC affiliate, came to us in March in pursuit of a story about service dogs and their respective journeys—the story of Paws & Effect. Reporter Jannay Towne took great care and consideration putting the piece together about our service dogs in-training, our puppy-raisers, and our recipients. 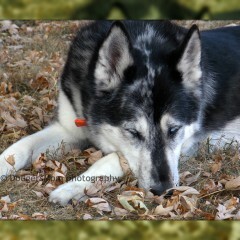 "Dogs on Duty: Service Dogs for Combat Veterans", was the wonderful result. Enjoy. ABC5 News Des Moines, IA ABC5's coverage of last night's puppies, raisers, and generous donation from Hy-Vee, Inc.
A Service Dog has a Tremendous Impact. 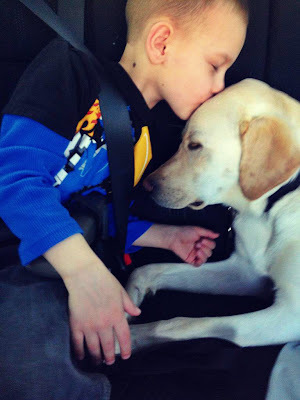 Taken the first day Traverse was with his new family, this photo speaks volumes about the impact a service dog has on both its recipient and the people with whom they live. Words can not adequately express the relationship seen here, but it is visible moments like this that make all of our efforts worthwhile. Look at that smile on Roo. Roo has settled in nicely at the Iowa National Guard Armory in Iowa City. SGT Mcartor is Roo's current handler and has made certain that Roo receives the best care and attention. Roo has attended recruiting events at local high schools in addition to his general morale boosting within the hallways and offices at the armory. We couldn't be more proud to support those who have served our country. The Spring 2013 placement class took a field trip to Jethro's BBQ in the Drake neighborhood where service dog access has never been denied. They welcomed us with open arms. 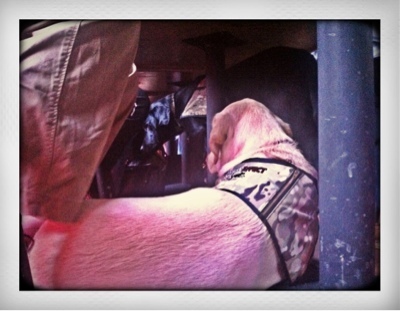 Our table had eight service dogs laying under the table and no one (the other patrons) knew the difference. 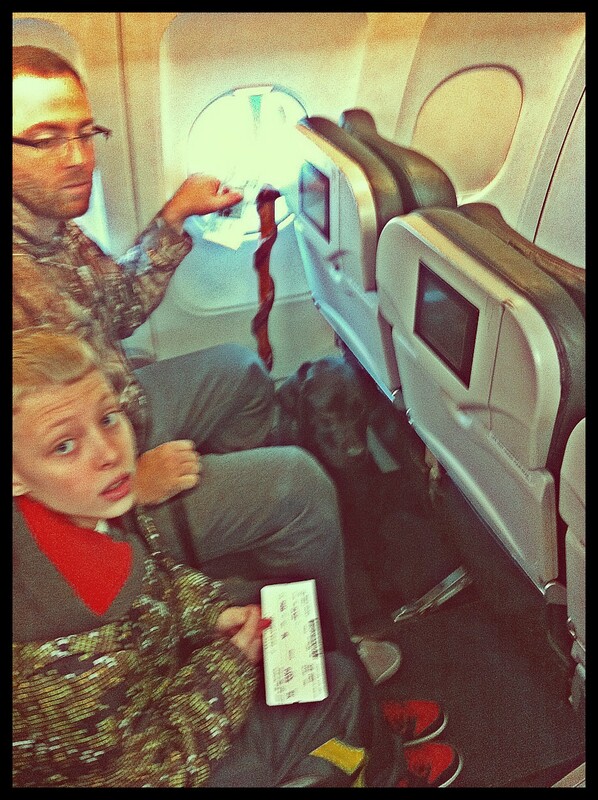 The service dogs performed exceptionally well. 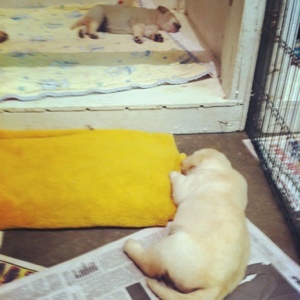 A testament to the socialization our puppy raisers provided them during their training. Nice to see the relationships turning out so nice. One important component to the service dog placement course is the recipients commitment to an integration back into the community. 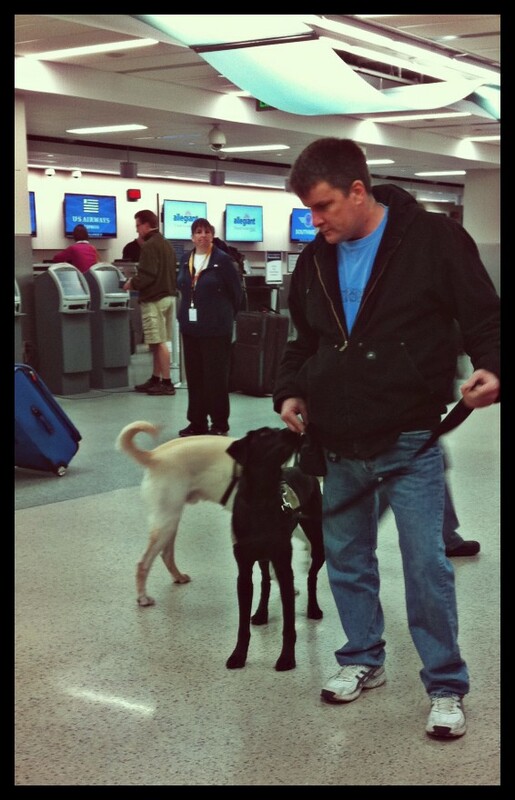 It's not merely taking off your shoes, removing your jacket and emptying your pockets when traveling with a service dog, so, Paws & Effect sets up a training session at the airport. The lesson shows everyone how to handle a service dog while going through the TSA screening, boarding and exiting a plane. 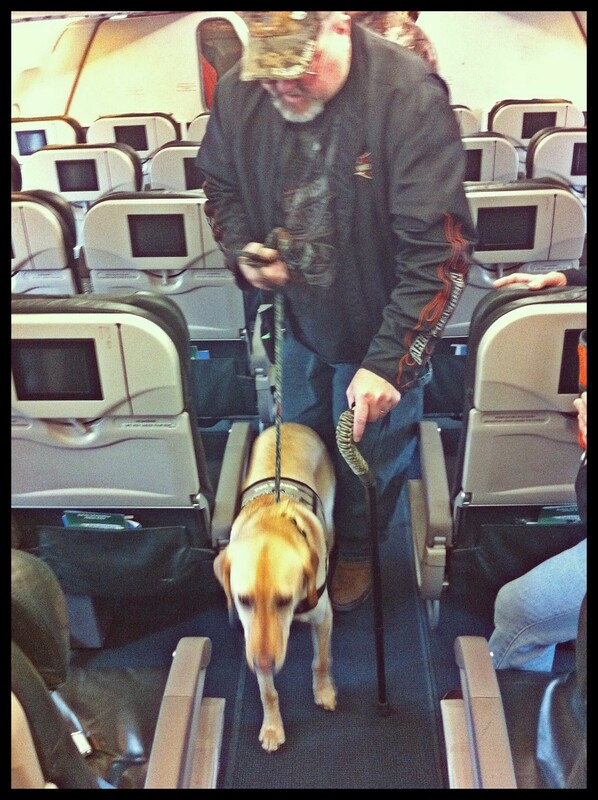 Frontier Airlines and the TSA were gracious enough to allow, Paws & Effect and the recipients of their service dogs, to have secure access to the airport and one of Frontier Airlines jets. The training was a great success. Thanks to everyone who volunteered and participated in this training session. It's worth your time to listen. 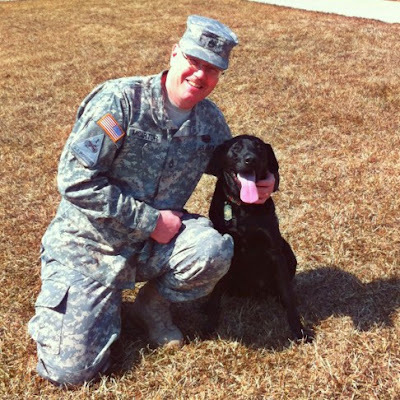 Iowa Public Radio - River to River aired this story yesterday featuring an Iowa veteran who received "Honor" his companion, a graduate of the Paws & Effect's service dog program a year ago this month. March may bring the madness of the big basketball tournament but Paws & Effect goes beyond that by bringing together eight veterans with service dogs. The journey of healing and reintegration begins today. 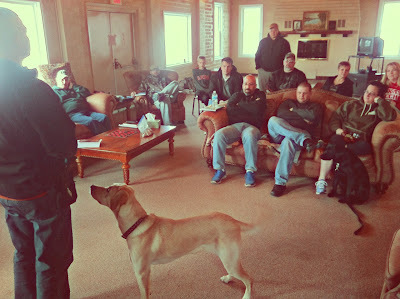 The veterans will get to know how to handle the dogs and have plenty of time to bond with their new companions over the next two weeks at Camp Dodge, Iowa. 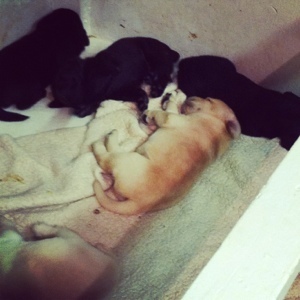 They will also get to build a camaraderie with the placement volunteers and their puppy raisers. 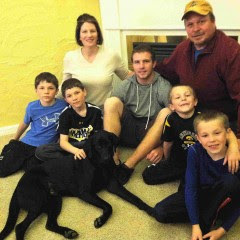 We truly thank the puppy raisers and volunteers for their loyalty and commitment to the program. We know that over the past eighteen months the program was not without its ups and downs, but through and through these veterans now have an opportunity at a better life. Reflect on this moment and let it fill your hearts with the warmth of joy and accomplishment. With great honor and pride, we welcome the Military Installation litter to Paws & Effect. The next couple years will be an endeavor of acclimation and service for these little guys. 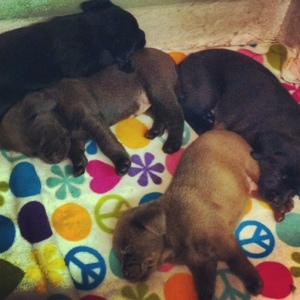 Our hearts pour out positive energy for all their future challenges and to the commitment of all of our puppy raisers. "Nicole Shumate, Founder and Executive Director of the nonprofit organization Paws & Effect, will discuss the strategies behind their award winning public service campaign, “We Serve with Honor.” The organization trains therapy and service dogs and places them with people who need them. While developing their PSA media campaign Paws & Effect was focused on placing dogs with combat veterans in Iowa who have disabilities or who have been diagnosed with post-traumatic stress disorder. The "We Serve With Honor" campaign won a 2010 Gold ADDY from the Des Moines-area AAF, 2010 Silver ADDY from District 9 of the AAF, and winner of the 2011 PRSA of Central Iowa PRIME Award in the Not for Profit category. The campaign was also entered into the 2010 National ADDY competition."